For similar names, including Mac OS 8, see OS8 (disambiguation). iOS 8 is the eighth major release of the iOS mobile operating system developed by Apple Inc., being the successor to iOS 7. It was announced at the company's Worldwide Developers Conference on June 2, 2014, and was released on September 17, 2014. It was succeeded by iOS 9 on September 16, 2015.
iOS 8.4.1 running on an iPhone 6 Plus featuring the typical iOS pre-loaded apps. iOS 8 incorporated significant changes to the operating system. It introduced Continuity, a cross-platform (Mac, iPhone, and iPad) system that enables communication between devices in different product categories, such as the ability to answer calls and reply to SMS on the Mac and iPad. Continuity includes a "Handoff" feature that lets users start a task on one device and continue on another. Other changes included a new Spotlight Suggestions search results feature that provides more detailed results; Family Sharing, where a family can link together their accounts to share content, with one parent as the administrator with permission controls; an updated keyboard with QuickType, providing contextual predictive word suggestions; and Extensibility, which allows for easier sharing of content between apps. Third-party developers got additional features to integrate their apps deeper into the operating system, including support for widgets in the Notification Center, and the ability to make keyboards that users can replace the default iOS keyboard with. App updates in the release included the new Health app, which can aggregate data from different fitness apps, as well as enabling a Medical ID accessible on the lock screen for emergencies; support for iCloud Photo Library in the Photos app, which enables photos to be synchronized and stored in the cloud; and iCloud Drive, which lets users store files in the cloud and browse them across devices. In iOS 8.4, Apple updated its Music app with a streaming service called Apple Music, and a 24-hour radio station called Beats 1. Reception of iOS 8 was positive. Critics praised Continuity and Extensibility as major features enabling easier control and interaction between different apps and devices. They also liked the QuickType keyboard word suggestions, and highlighted Spotlight Suggestions for making the iPhone "almost a portable search portal for everything". However, reviewers noted that the full potential for iOS 8 would only be realized once third-party developers integrated their apps to support new features, particularly widgets in the Notification Center. Roughly a week after release, iOS 8 had reached 46% of iOS usage share. In October 2014, it was reported that the adoption rate had "stalled", only increasing by "a single percentage point" from the previous month. This situation was blamed on the requirement of a high amount of free storage space to install the upgrade, especially difficult for iPhones sold with 8 or 16 gigabytes of maximum storage space. The following December, iOS 8 had reached 63% usage share, a notable 16% increase from the October measurement. iOS 8 was introduced at the company's Worldwide Developers Conference on June 2, 2014, with the first beta made available to conference attendees after the keynote presentation. iOS 8 was officially released on September 17, 2014.
iOS 8.0.1 was released on September 24, 2014, as the first update to iOS 8. The update was meant to bring various bug fixes; however, the update was withdrawn due to an issue that disabled Touch ID and cellular network connectivity on some models. Apple instead recommended affected users reinstall the initial iOS 8 release and wait until version 8.0.2 was ready. iOS 8.0.2 was released on September 25, 2014, a day after the release of iOS 8.0.1. It included fixes for the bugs present in the previous update. iOS 8.1 was released on October 20, 2014. The update introduced Apple Pay for iPhone 6 and 6 Plus in the United States, added iCloud Photo Library in beta status, returned the Camera Roll in Photos, and added Continuity features, which enable iPhone users to read and send SMS and MMS from their iPad and Mac. It also introduced Instant Hotspot, allowing Mac users to remotely activate the "Personal hotspot" feature on a nearby iPhone. iOS 8.1.1 was released on November 17, 2014, with bug fixes and performance improvements for iPhone 4S and iPad 2.
iOS 8.1.2 was released on December 9, 2014, with a fix for an issue where ringtones purchased through the iTunes Store would be removed from an iOS device. iOS 8.1.3 was released on January 27, 2015. The update included bug fixes and reduced the amount of storage space required to perform an iOS update. iOS 8.2 was released on March 9, 2015. The update included support for the Apple Watch, with the Apple Watch app on iPhone, providing App Store and configuration options access; Health with options for units of measurement; as well as lots of stability improvements and bug fixes. Before the release of iOS 8.3, Apple announced a public beta testing program, allowing consumers to receive and test upcoming versions of the iOS software before the official, general release. iOS 8.3 was released on April 8, 2015. The update included emoji improvements, such as an updated emoji keyboard picker that organizes emoji into categories, new diversified emoji, and skin tone modifiers; new languages for Siri; support for wireless CarPlay; as well as major bug fixes and improvements. iOS 8.4 was released on June 30, 2015. The update introduced Apple Music and therefore overhauled the existing Music app with the Apple Music service. iOS 8.4 also relocated audiobooks from the Music app to the iBooks app. iOS 8.4.1 was released on August 13, 2015, with various fixes for Apple Music. iOS 8 introduced Continuity, a cross-platform (Mac, iPhone, and iPad) system that enables communication between devices in different product categories. Continuity enables phone call functionality for the iPad and Mac, in which calls are routed through the iPhone over to a secondary device. The secondary device then serves as a speaker phone. This also brings SMS support to the iPad and Mac, an extension of the iMessage feature in previous versions. Continuity adds a feature called "Handoff", that lets users start a task on one device and continue on another, such as composing an e-mail on the iPhone and then continuing it on the iPad before sending it on the Mac. In order to support Handoff and Continuity, Macs needed to have the OS X Yosemite operating system, which was released in October 2014, as well as support for Bluetooth low energy. iOS 8 introduced Spotlight Suggestions, a new search feature that integrates with many websites and services to show more detailed search results, including snippets of Wikipedia articles, local news, quick access to apps installed on the device, iTunes content, movie showtimes, nearby places, and info from various websites. Spotlight Suggestions are available on the iOS home screen as well as in the Safari web browser search bar. The drop-down Notification Center has now been redesigned to allow widget functionality. Third-party apps can add widget support to their apps that let users see information in the Notification Center without having to open each respective app. Users can add, rearrange, or remove any widgets, at any time. Examples of widgets include a Weather app showing current weather, and a Calendar app showing upcoming events. Notifications are now actionable, allowing users to reply to a message while it appears as a quick drop-down, or act on a notification through the Notification Center. iOS 8 includes a new predictive typing feature called QuickType, which displays word predictions above the keyboard as the user types. Apple now allows third-party developers to make keyboard apps that users can replace the default iOS keyboard with. For added privacy, Apple added a settings toggle called "Allow Full Access", that optionally enables the keyboard to act outside its app sandbox, such as synchronizing keyboard data to the cloud, third-party keyboards are not allowed to use Siri for voice dictation, and some secure text fields do not allow input. iOS 8 introduced Family Sharing, which allows up to 6 people to register unique iTunes accounts that are then linked together, with one parent becoming the administrator, controlling the overall experience. Purchases made on one account can be shared with the other family members, but purchases made by kids under 13 years of age require parental approval. Purchases made by adults will not be visible for the kids at all. Family Sharing also extends into apps; a Shared album is automatically generated in the Photos app of each family member, allowing everyone to add photos, videos, and comments to a shared place. An Ask to Buy feature allows anyone to request the purchase of items in the App Store, iTunes Store, and iBooks Store, as well as in-app purchases and iCloud storage, with the administrator having the option to either approve or deny the purchase. The multitasking screen shows a list of recently called and favorited contacts. The feature can be turned off in Settings. iOS 8 includes an additional data roaming option in Settings for European users, allowing greater control over data usage abroad. The Siri personal voice assistant now has integrated Shazam support. Asking Siri "What song is this?" will identify what song is playing. Wi-Fi calling has been added to allow mobile phone calls over Wi-Fi. Mobile operator carriers can then enable the Voice-over-Wi-Fi functionality in their services. The Camera app gets two new features; time-lapse and self-timer. Time-lapse records frames at shorter intervals than normal film frequencies and builds them into movies, showing events in a faster speed. Self-timer gives the user the option of a three-second or ten-second countdown before automatically taking a photo. iPads can now take pictures in panoramic mode. iOS 8 added iCloud Photo Library support to the Photos app, enabling photo synchronization between different Apple devices. Photos and videos were backed up in full resolution and in their original formats. This feature almost meant that lower-quality versions of photos could be cached on the device rather than the full-size images, potentially saving significant storage space on models with limited storage availability. The Photos app received better search, with different search categorization options, including Nearby, One Year Ago, Favorites, and Home, based on geolocation and date of photo capture. Additionally, the Photos app gained more precise editing controls, including improved rotation; one-touch auto-enhancement tools; and deeper color adjustments, such as brightness, contrast, exposure, and shadows. There is also an option to hide a photo without deleting it. Apple added an Extensibility feature in iOS 8, that allows filters and effects from third-party apps to be accessed directly from within a menu in the standard Photos app, rather than having to import and export photos through each respective app to apply effects. In the initial release of iOS 8, Apple removed a "Camera Roll" feature from the Photos app. Camera Roll was an overview of all photos on the device, but was replaced by a "Recently Added" photo view displaying photos by how recently the user captured them. Despite being replaced by a "Recently Added" album, the removal of Camera Roll sparked user complaints, which Apple returned the feature in the iOS 8.1 update. In iOS 8, Messages gets new features for group conversations, including a Do Not Disturb mode that disables conversation notifications, as well as the ability to remove participants from the chat. A new Tap to Talk chat button lets users send quick voice comments to a recipient, and a Record button allows users to record short videos. For interaction between two Apple users, the Messages app allows users to send short picture, video or audio clips with a 2-minute expiration time. In the Settings app, the user has the option to have messages be automatically deleted after a certain time period. In the Safari web browser, developers can now add support for Safari Password Sharing, which allows them to share credentials between sites they own and apps they own, potentially cutting down on the number of times users need to type in credentials for their apps and services. The browser also adds support for the WebGL graphics API. In a similar style as a file manager, the iCloud Drive is a file hosting service that, once enabled in Settings, lets users save any kind of file in the app, and the media is synchronized to other iOS devices, as well as the Mac. In iOS 8, Apple updated App Store with an "Explore" tab providing improved app discovery, trending searches in the "Search" tab, and the ability for developers to bundle multiple apps into a single discounted package. New "preview" videos allow developers to visually show an app's function. HealthKit is a service that allows developers to make apps that integrate with the new Health app. The Health app primarily aggregates data from fitness apps installed on the user's device, except for steps and flights climbed, which are tracked through the motion processor on the user's iPhone. Users can enter their medical history in Medical ID, which is accessible on the lock screen, in case of an emergency. Manufacturers of HomeKit-enabled devices are required to purchase a license, and all HomeKit products are required to have an encryption co-processor. Equipment manufactured without HomeKit-support can be enabled for use through a "gateway" product, such as a hub that connects between those devices and the HomeKit service. The Passbook app on iOS 8 was updated to include Apple Pay, a digital payment service, available on iPhone 6 and 6 Plus with the release of iOS 8.1. A new music streaming service, Apple Music, was introduced in the iOS 8.4 update. It allows subscribers to listen to an unlimited number of songs on-demand through subscriptions. With the release of the music service, the standard Music app on iOS was revamped both visually and functionally to include Apple Music, as well as the 24-hour live radio station Beats 1. Notes received rich text editing support, with the ability to bold, italicize or underline text; and image support, allowing users to post photos in the app. The Weather app now uses weather data from The Weather Channel instead of Yahoo!. The app also received slight changes in the user interface. iOS 8 added a new "Tips" app, that shows tips and brief information about the features in iOS on a weekly basis. iOS 8 allows Touch ID to be used in third-party apps. iOS 8 received positive reviews. Brad Molen of Engadget highlighted Continuity as a major advancement for users with multiple Apple devices. He also praised the Extensibility feature, allowing apps to share data, and liked the support for third-party keyboards. However, Molen noted that some of the new introductions - Family Sharing, Continuity, and iCloud Drive - require further diving into the Apple ecosystem to work. He particularly enjoyed actionable notifications and third-party widget support in Notification Center. Charles Arthur of The Guardian also liked Extensibility, as well as the new QuickType word suggestions functionality in the iOS keyboard. He criticized the lack of an option for choosing default apps, and he also criticized the Settings menu for being confusing and unintuitive. Darrell Etherington of TechCrunch praised the improvements to iMessage, writing: "Best for me has been the ability to mute and leave group conversations, which is something I’ve been sorely missing since the introduction of group iMessage conversations." He liked the new search and editing features in Photos, and the QuickType feature in the keyboard, but particularly highlighted Spotlight Suggestions as "one of the better features of iOS 8, even if it’s a small service addition", noting that "it makes your iPhone almost a portable search portal for everything." Martin Bryant of The Next Web wrote that "The real advances here are yet to come", adding that "Apple has included demonstrations of what can be done, but the true power of what’s under the hood will be realized over the coming days, weeks and months" as third-party developers gradually incorporate new features into their apps. On September 23, 2014, "roughly a week" after the release of iOS 8, user adoption of iOS 8 had reached 46%. In October 2014, Andrew Cunningham of Ars Technica reported that iOS 8 user adoption rate had "stalled", only climbing "a single percentage point" since the previous September measurement of 46%. Cunningham blamed the "over-the-air" update requiring 5 gigabytes to install, an "unusually large amount" that may have posed challenges to those using 8 gigabyte and 16 gigabyte devices. As an alternative, Apple offered the update via its iTunes software, but Cunningham noted that "An iTunes hookup is going to be even more out of the way these days than it was a few years ago, not least because Apple has spent the last three years coaching people to use their iDevices independently of their computers". In December, a new report from Ars Technica stated that iOS 8 usage had increased to 63%, up "a solid 16 percent". A study by Apteligent (formerly Crittercism) found that the rate at which apps crashed in their tests was 3.56% on iOS 8, higher than the 2% found on iOS 7.1. In September 2014, the iOS 8.0.1 update caused significant issues with Touch ID on iPhone 6 and cellular network connectivity on some models. Apple stated that affected users should reinstall the initial iOS 8 release until version 8.0.2 was ready. iOS 8.0.2 was released one day after 8.0.1, with a fix for issues caused by the 8.0.1 update. Forbes published several articles focusing on problems in iOS 8 regarding Wi-Fi and battery, Bluetooth, and calendar. In May 2015, news outlets reported on a bug where receiving a text message with a specific combination of symbols and Arabic characters, caused the Messages application to crash and the iPhone to reboot. The bug, named "effective power", could potentially continuously reboot a device if the message was visible on the lock screen. The flaw was exploited for the purpose of trolling, by intentionally causing others' phones to crash. The bug was fixed in iOS 8.4, an update released in June 2015. In September 2014, a hoax Apple advertisement for an alleged feature called "Wave" of iOS 8 circulated on Twitter, which promised users that they would be able to recharge their iPhone by heating it in a microwave oven. This feature does not exist, and the media cited numerous people reporting on Twitter that they had destroyed their iPhone by following the procedure described in the advertisement. With this release, Apple dropped support for the iPhone 4. ^ Brandom, Russell (September 9, 2015). "iOS 9 will be released on September 16th". The Verge. Vox Media. Retrieved December 30, 2016. ^ Crook, Jordan (June 2, 2014). "Apple Introduces iOS 8". TechCrunch. AOL. Retrieved December 21, 2016. ^ Savov, Vlad (June 2, 2014). "Apple announces iOS 8 with widgets and OS X Continuity". The Verge. Vox Media. Retrieved December 21, 2016. ^ Hall, Zac (September 9, 2014). "Apple releases iOS 8 GM ahead of Sep. 17 public release". 9to5Mac. Retrieved December 21, 2016. ^ a b Welch, Chris (September 24, 2014). "Apple pulls iOS 8.0.1 after users report major problems with update". The Verge. Vox Media. Retrieved December 21, 2016. ^ a b Smith, Mat (September 25, 2014). "Apple explains how to fix its busted iOS 8 update, new one coming soon". Engadget. AOL. Retrieved December 21, 2016. ^ a b Cunningham, Andrew (September 24, 2014). "iOS 8.0.1 disabling cellular and TouchID on some phones [Updated]". Ars Technica. Condé Nast. Retrieved December 21, 2016. ^ a b Breen, Christopher (September 25, 2014). "Apple quickly issues iOS 8.0.2 update". Macworld. International Data Group. Retrieved December 21, 2016. ^ Siegal, Jacob (September 25, 2014). "After a bad rollout for iOS 8.0.1, Apple has released iOS 8.0.2". BGR. Penske Media Corporation. Retrieved December 21, 2016. ^ Langley, Hugh (September 26, 2014). "iOS 8.0.2 is now available to download, and this one shouldn't break your iPhone". TechRadar. Future plc. Retrieved December 21, 2016. ^ Clover, Juli (October 20, 2014). "Apple Releases iOS 8.1 With Apple Pay Support, SMS Relay, Camera Roll, and More". MacRumors. Retrieved December 21, 2016. ^ Clover, Juli (November 17, 2014). "Apple Releases iOS 8.1.1 With Bug Fixes, Performance Improvements for iPad 2 and iPhone 4s". MacRumors. Retrieved December 21, 2016. ^ Clover, Juli (December 9, 2014). "Apple Releases iOS 8.1.2 With Fix for Disappearing Ringtone Issue". MacRumors. Retrieved December 21, 2016. ^ Clover, Juli (January 27, 2015). "Apple Releases iOS 8.1.3 With Bug Fixes, Storage Size Reduction". MacRumors. Retrieved December 21, 2016. ^ Hall, Zac (January 27, 2015). "Apple releases iOS 8.1.3 software update w/ stability improvements, reduces space required to update". 9to5Mac. Retrieved December 21, 2016. ^ Cunningham, Andrew (March 9, 2015). "Apple releases iOS 8.2 today with Apple Watch support and plenty of bug fixes". Ars Technica. Condé Nast. Retrieved December 21, 2016. ^ Yamshon, Leah (March 9, 2015). "Apple releases Apple Watch app with iOS 8.2 update". Macworld. International Data Group. Retrieved December 21, 2016. ^ Clover, Juli (March 12, 2015). "Apple Launches New iOS Beta Testing Program, Seeds iOS 8.3 to Testers". MacRumors. Retrieved December 21, 2016. ^ Clover, Juli (April 8, 2015). "Apple Releases iOS 8.3 With Emoji Updates, Wireless CarPlay, Space Bar UI Fix". MacRumors. Retrieved December 21, 2016. ^ a b Clover, Juli (June 30, 2015). "Apple Releases iOS 8.4 With Apple Music, Beats 1, and Revamped Music App". MacRumors. Retrieved December 21, 2016. ^ Hall, Zac (June 30, 2015). "Apple releases iOS 8.4 with Apple Music, Beats 1, and all-new Music app". 9to5Mac. Retrieved December 21, 2016. ^ Matney, Lucas (August 13, 2015). "Apple Releases iOS 8.4.1 Update With Various Apple Music Fixes". TechCrunch. AOL. Retrieved December 21, 2016. ^ a b Hughes, Neil (September 17, 2014). "How to use iOS 8 Continuity between your iPhone & iPad for calls, texts, apps & more". AppleInsider. Retrieved December 22, 2016. ^ Whitney, Lance (June 2, 2014). "Apple's Handoff brings proximity awareness to your devices". CNET. CBS Interactive. Retrieved December 22, 2016. ^ Kastrenakes, Jacob (October 16, 2014). "OS X Yosemite will be available today from the Mac App Store". The Verge. Vox Media. Retrieved December 22, 2016. ^ Smith, Chris (June 3, 2014). "Here's one major new Yosemite and iOS 8 feature that got overlooked". BGR. Penske Media Corporation. Retrieved December 22, 2016. ^ Esposito, Dom (June 2, 2014). "Hands-on with Spotlight Suggestions in iOS 8 (Video)". 9to5Mac. Retrieved December 22, 2016. ^ Walter, Derek (September 19, 2014). "Get to know iOS 8: Customize your Notification Center with handy new widgets". Macworld. International Data Group. Retrieved December 22, 2016. ^ Paris, Steve (November 26, 2014). "How to use iOS 8 Notification Centre". Macworld. International Data Group. Retrieved December 22, 2016. ^ Siegal, Jacob (June 2, 2014). "The most important new feature on iOS 8: Actionable notifications". BGR. Penske Media Corporation. Retrieved December 30, 2016. ^ Ritchie, Rene (June 24, 2014). "Interactive notifications in iOS 8: Explained". iMore. Retrieved December 30, 2016. ^ Cipriani, Jason (September 19, 2014). "Using iOS 8's QuickType keyboard". CNET. CBS Interactive. Retrieved December 23, 2016. ^ Hattersley, Lucy (September 3, 2014). "How to use keyboards in iOS 8". Macworld. International Data Group. Retrieved December 23, 2016. ^ Lomas, Natasha (October 4, 2014). "Everything You Need To Know About iOS 8 Keyboard Permissions (But Were Afraid To Ask)". TechCrunch. AOL. Retrieved December 23, 2016. ^ Kelly, Gordon (September 22, 2014). "iOS 8: The Best Apple Keyboard Replacements". Forbes. Retrieved December 23, 2016. ^ Kosner, Andrew (June 14, 2014). "Apple's New Family Plan Makes It Easy To Solve The iTunes Identity Crisis". Forbes. Retrieved December 26, 2016. ^ "Family Sharing. Bring harmony to your family's digital life". Apple Inc. Retrieved December 26, 2016. ^ "Request and make purchases with Ask to Buy". Apple Inc. Retrieved December 26, 2016. ^ Guarino, Sarah (September 28, 2014). 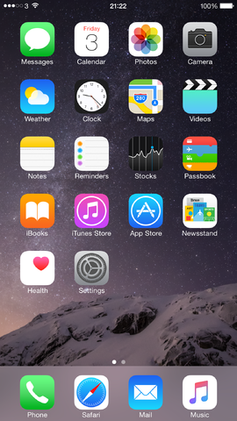 "iOS 8 How-to: Customize and disable the contacts section in the multitasking interface". 9to5Mac. Retrieved December 26, 2016. ^ Kazmucha, Allyson (October 9, 2014). "How to use multitasking contacts in iOS 8". iMore. Retrieved December 26, 2016. ^ Bell, Killian (July 22, 2014). "Europeans get new roaming options in iOS 8 beta 4". Cult of Mac. Retrieved December 27, 2016. ^ Smith, Chris (July 22, 2014). "iOS 8 beta 4 comes with special roaming setting for Europe". BGR. Penske Media Corporation. Retrieved December 27, 2016. ^ Whitney, Lance (September 18, 2014). "Shazam-powered Siri can now name that tune in iOS 8". CNET. CBS Interactive. Retrieved December 27, 2016. ^ Kumparak, Greg (September 12, 2014). "AT&T To Get iPhone 6-Friendly Wi-Fi Calling In 2015". TechCrunch. AOL. Retrieved December 27, 2016. ^ Sorrel, Charlie (September 18, 2014). "iOS 8 gives the Photos app superpowers". Cult of Mac. Retrieved December 22, 2016. ^ "iOS 8: New Features". MacRumors. Retrieved December 29, 2016. ^ a b c Ritchie, Rene (August 15, 2014). "Photos in iOS 8: Explained". iMore. Retrieved December 22, 2016. ^ Murphy, Samantha. "14 Hidden Tricks and Tools in iOS 8". Mashable. Retrieved 2017-03-07. ^ Ritchie, Rene (July 7, 2014). "Inter-app photo and video editing in iOS 8: Explained". iMore. Retrieved December 22, 2016. ^ Smith, Chris (September 23, 2014). "This might just be the most annoying new feature in iOS 8". BGR. Retrieved January 13, 2017. ^ Cook, James (September 22, 2014). "iPhone Users Are Freaking Out After Apple Removed 'Camera Roll' And Made It Harder To Delete Photos". Business Insider. Axel Springer SE. Retrieved January 8, 2017. ^ Kerr, Dara; Tibken, Shara (October 16, 2014). "Miss the camera roll? Apple iOS 8.1 to bring it back". CNET. CBS Interactive. Retrieved January 8, 2017. ^ Rossignol, Joe (June 2, 2014). "iOS 8 improves messaging on iMessage". iDownloadBlog. Retrieved December 24, 2016. ^ Klosowski, Thorin (September 17, 2014). "How to Use All of Messages' New Features in iOS 8". Lifehacker. Univision Communications. Retrieved January 8, 2017. ^ Aguilar, Nelson. "11 Hidden Features in iOS 8's New Messages App for iPhone & iPad". iOS Gadget Hacks Blog. Retrieved January 8, 2017. ^ Tufnell, Nicholas (November 7, 2014). "25 hidden features from iOS 8, Apple's new operating system". The Guardian. Guardian Media Group. Retrieved March 27, 2017. ^ Cunningham, Andrew (September 17, 2014). "iOS 8, thoroughly reviewed". Ars Technica. Condé Nast. Retrieved December 24, 2016. ^ Bohon, Cory (October 22, 2014). "Pro tip: How to use iCloud Drive in iOS 8". TechRepublic. CBS Interactive. Retrieved December 26, 2016. ^ Sumra, Husain (June 2, 2014). "Apple to Enhance App Store with 'Explore' Tab, App Bundles, Beta Testing, and More". MacRumors. Retrieved July 20, 2017. ^ Profis, Sharon (October 13, 2014). "The complete guide to the iPhone's Health app". CNET. CBS Interactive. Retrieved December 26, 2016. ^ Ritchie, Rene (August 27, 2014). "HomeKit in iOS 8: Explained". iMore. Retrieved December 26, 2016. ^ "Working with HomeKit". Apple Inc. Retrieved December 26, 2016. ^ Higginbotham, Stacey (June 10, 2015). "What one startup CEO learned from handling Apple's HomeKit mess". Fortune. Time Inc. Retrieved December 26, 2016. ^ Ricker, Thomas; Kastrenakes, Jacob (January 8, 2015). "First HomeKit devices confirm Apple TV's limited role in home automation". The Verge. Vox Media. Retrieved December 26, 2016. ^ Hughes, Neil (October 20, 2014). "How to set up Apple Pay on an iPhone 6 or 6 Plus running iOS 8.1, and where you can use it right now". AppleInsider. Retrieved December 29, 2016. ^ Caldwell, Serenity; Moren, Dan (June 3, 2014). "20-plus iOS 8 features Apple didn't talk about". Macworld. International Data Group. Retrieved January 8, 2017. ^ Padhiyar, Jignesh (January 29, 2015). "How To Format Text And Add Pictures in Notes App in iOS 8 on iPhone and iPad". Retrieved January 13, 2017. ^ Swisher, Kara (June 20, 2014). "As Weather Channel Blows Yahoo Off Apple's Upcoming iOS 8, App Storms Ahead for Mayer". Recode. Vox Media. Retrieved January 8, 2017. ^ Kahn, Jordan (June 20, 2014). "Why Apple switched from Yahoo to Weather Channel for Weather data in iOS 8". 9to5Mac. Retrieved January 8, 2017. ^ Clover, Juli (June 3, 2014). "iOS 8 Ditches Yahoo Weather for Content From The Weather Channel". MacRumors. Retrieved February 19, 2017. ^ Hughes, Neil (June 20, 2014). "Weather Channel providing Apple more detailed data for iOS 8 Weather app than Yahoo did". AppleInsider. Retrieved January 8, 2017. ^ Clover, Juli (July 21, 2014). "iOS 8 Beta 4 Tidbits: Tips App, Control Center Redesign, New Display Options". MacRumors. Retrieved January 8, 2017. ^ Hughes, Neil (September 17, 2014). "Apple opens Touch ID to third-party applications with iOS 8". AppleInsider. Retrieved February 18, 2017. ^ Molen, Brad (September 16, 2014). "iOS 8 review: Some overdue updates, but well worth the wait". Engadget. AOL. Retrieved December 30, 2016. ^ Arthur, Charles (September 17, 2014). "iOS 8 review: the iPhone and iPad get customised, extended and deepened". The Guardian. Guardian Media Group. Retrieved December 30, 2016. ^ Etherington, Darrell (September 16, 2014). "iOS 8 Review: Refinements And Relaxed Limitations Add Up For A Better Experience". TechCrunch. AOL. Retrieved December 30, 2016. ^ Bryant, Martin (September 17, 2014). "iOS 8 review: The real advances here are yet to come". The Next Web. Retrieved December 30, 2016. ^ Padilla, Richard (September 23, 2014). "Apple's App Store Usage Numbers Suggest 46% Adoption Rate for iOS 8". MacRumors. Retrieved February 18, 2017. ^ Cunningham, Andrew (October 9, 2014). "There's more than one reason why iOS 8's growth has stalled". Ars Technica. Condé Nast. Retrieved February 18, 2017. ^ Cunningham, Andrew (December 10, 2014). "Apple dashboard says iOS 8 now runs on about two-thirds of devices". Ars Technica. Condé Nast. Retrieved February 18, 2017. ^ Brown, Bob (September 22, 2014). "Crashing Apple's iOS 8 party". Network World. Retrieved December 27, 2016. ^ Kelly, Gordon (September 22, 2014). "iOS 8 Hit By WiFi And Battery Life Complaints". Forbes. Retrieved December 27, 2016. ^ Kelly, Gordon (October 2, 2014). "iOS 8 Troubles Continue. iPhones Hit By Bluetooth Problems". Forbes. Retrieved December 27, 2016. ^ Kelly, Gordon (January 23, 2015). "Apple's iOS 8 Crisis Continues With Controversial New Bug". Forbes. Retrieved December 27, 2016. ^ Clover, Juli (May 26, 2015). "New iOS Bug Crashing iPhones Simply by Receiving a Text Message [Includes Fix]". MacRumors. Retrieved December 27, 2016. ^ Peckham, James (May 27, 2015). "This single text message is crashing people's iPhones - here's the fix". TechRadar. Future plc. Retrieved December 27, 2016. ^ Miller, Chance (May 26, 2015). "iOS bug causes Messages to crash, iPhone to reboot when a certain text is received". 9to5Mac. Retrieved December 27, 2016. ^ Chowdhry, Amit (May 29, 2015). "Apple Acknowledges Disastrous iPhone Messages Bug, Suggests This Temporary Fix". Forbes. Retrieved December 27, 2016. ^ Griffin, Andrew (May 28, 2015). "iPhone 'effective power' text: how to be safe from iOS bug that lets people crash your phone". The Independent. Retrieved December 27, 2016. ^ Chowdhry, Amit (May 27, 2015). "New Apple iOS Bug Causes Shut Downs And App Crashes, But There Is A Fix". Forbes. Retrieved December 27, 2016. ^ Horton, Helena (May 29, 2015). "This 'effective power' text will make your friend's iPhone crash if you send it to them - here's how to protect your own phone". The Daily Telegraph. Telegraph Media Group. Retrieved December 27, 2016. ^ Cunningham, Andrew (June 30, 2015). "Apple releases iOS 8.4 with new Music app, fix for crashing bug". Ars Technica. Condé Nast. Retrieved December 27, 2016. ^ Paton, Callum. "iPhone 'Wave': iOS 8 hoax claims you can charge your iPhone in the microwave - you can't". The Independent. Retrieved February 16, 2017. ^ Bogos, Steven (September 21, 2014). "Wave Hoax Tricks Gullible iPhone Users Into Microwaving Their Phones". The Escapist. Defy Media. Retrieved February 16, 2017. ^ La, Lynn (June 2, 2014). "Apple devices that aren't compatible with iOS 8". CNET. CBS Interactive. Retrieved February 16, 2017. "iOS 8". Archived from the original on September 5, 2015. Retrieved March 12, 2011.